The Rangers found a way to win yet again thanks to some overtime heroics, securing their 16th win in the last 19 games for the Rangers. Photo courtesy of MSG Photos. The Rangers (27-13-4) found a way to come back and win in overtime, defeating the Ottawa Senators (18-19-8) by a final score of 3-2 thanks to a game winning goal from Carl Hagelin. The Rangers head into the All Star break with a three game win streak, and wins in 16 of their last 19 games. With the Penguins and Capitals losing in overtime, the Rangers are now in second place in the Metropolitan Division, tied with the Penguins in points, but with games in hand. The Blueshirts have been defined by finding ways to win, overcoming adversity and winning the hard fought games. That was the case again today, answering two quick Ottawa goals and coming away with the win in a game where they were not at their best. Tonight’s game showcased both goaltenders making some fantastic saves for both teams. Anderson finished the night with 32 saves, keeping the Senators in the game, and not getting the result due to a lack of result again. Henrik Lundqvist was strong again, continuing his dominance during the Rangers recent stretch. Lundqvist finished with 33 saves, improving his record to 23-9-3 this season. Lundqvist also continues to improve his stats, with a strong save percentage to .921% and his goals allowed average to 2.25. Lundqvist has won 14 of his last 16 stars, allowing just two goals or less in 13 of those starts. 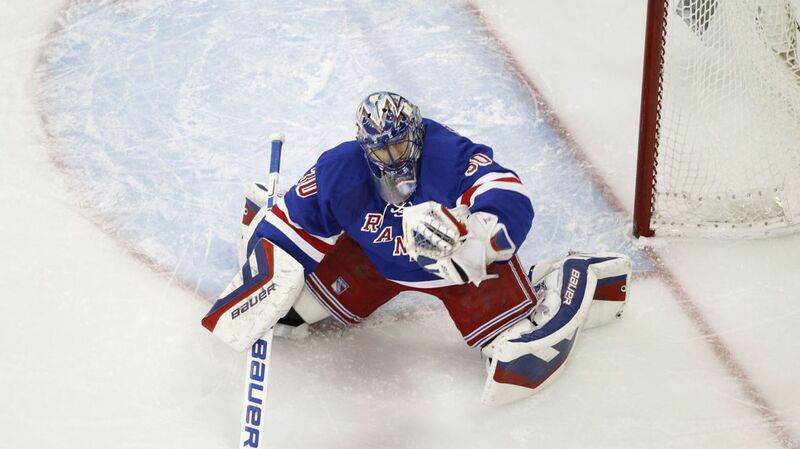 Henrik Lundqvist was strong yet again, making 33 saves for his 23 victory of the season. Lundqvist continues to be the backbone of this Rangers team. Photo courtesy of MSG Photos. Both teams played cautiously and reserved in the opening period, with neither team skating like they wanted to. Matt Hunwick had the most notable chances for the Rangers, with two of his one timers getting stopped. The Rangers opened the scoring in the second period, with Kevin Hayes scoring his sixth goal of the season. Jesper Fast did a great job to work the puck into the Senators zone, with the puck eventually getting to Dan Girardi at the point. Girardi fired a low shot, and Hayes used his long reach to get the puck past Craig Anderson, giving the Rangers a 1-0 lead. The other assist went to Carl Hagelin. Kevin Hayes scored the first goal of the game for the Rangers, using his long reach to slide the puck past Craig Anderson. Photo courtesy of MSG Photos. However, it didn’t take Ottawa to answer back. Four minutes after the Hayes goal, the Senators captain Erik Karlsson firing a wrister past Lundqvist to tie the game at one. Less than a minute later, Lee Stempniak was sent to the box for high sticking. It took the Senators just nine seconds to take the lead. Alex Chiasson’s snap shot was stopped by the left pad of Lundqvist, but Milan Michalek was able to slide the puck through the pads of Lundqvist, and Ottawa finished the second period with a 2-1 lead. The Rangers came out firing on all cylinders, and evened the score just 2:42 into the third period. Henrik Lundqvist made a great sprawling glove save, and the Rangers went the other way. Martin St. Louis made an outlet pass to Marc Staal, who joined Chris Kreider on the rush. Staal fed the puck to a streaking Kreider, who put if off of the post and into the back of the net, tying the game at two. Chris Kreider scored a beautiful breakaway goal for the Rangers, thanks to some great passing from Martin St. Louis and Marc Staal. Photo courtesy of MSG Photos. 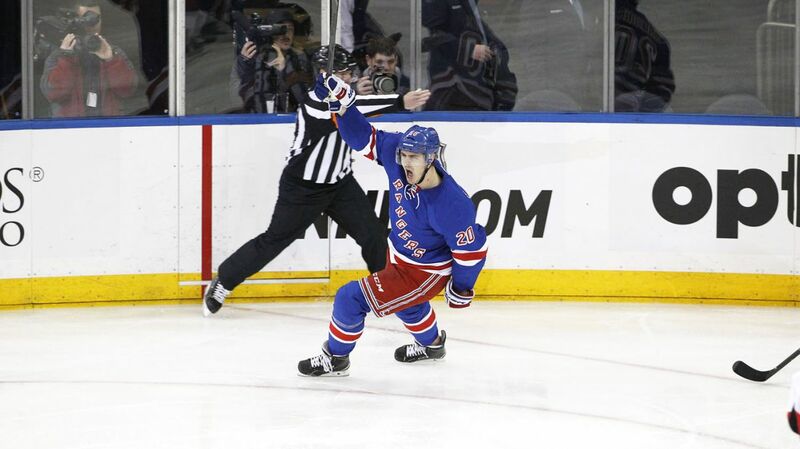 The Rangers nearly won the game at the end of the period, when Dan Girardi fired a shot that was saved by Anderson. The puck bounced off of Rick Nash and hit the post, and the game was sent to overtime. In overtime, the Rangers had most of the momentum, and it was Carl Hagelin who sealed the victory for New York. Hagelin cut to the net, and Derek Stepan made a fantastic spinning, backhanded pass, which was deflected past Anderson to give the Rangers a 3-2 lead, and their third consecutive victory. Carl Hagelin has struggled to consistently finish his chances this season, despite putting up a respectable 18 points (9-9-18) this season. Hagelin had a good game today, creating chances with his speed like he always does, and finishing with a goal and an assist. Hopefully the goal he scored today in a crucial momentum building game builds some confidence, and created more production from the Swedish winger. Carl Hagelin had a strong game for the Rangers, notching an assist on Hayes’ goal and scoring the game winner in overtime. Photo courtesy of MSG Photos. Rangers defenders had another strong game today, most notable Ryan McDonagh and Marc Staal. Ryan McDonagh made a ton of nice plays, most notably on Mark Stone, who was wide open on breakaway. Marc Staal also had a tremendous defensive game, anchoring the second pairing and assisting on Kreider’s goal. The Rangers success has come in part from strong defense, and McDonagh and Staal proved that tonight. Chris Kreider is red hot, scoring five goals and four assists in the past 10 games. It seems that Kreider has at least one breakaway a game, and is a dangerous threat every night due to his speed and strength. Kreider now has 24 points (10-14-24) this season. The Rangers are a better team when Chris Kreider is playing well. The Rangers will have a week off for the All Star break, with their next game coming on January 27, when they visit the Islanders at Nassau Coliseum. Posted on January 21, 2015, in Game Recaps and tagged Alain Vigneault, Bobby Ryan, Cam Talbot, Carl Hagelin, Chris Kreider, Dan Boyle, Dan Girardi, Derek Stepan, Derick Brassard, Dominic Moore, Erik Karlsson, Henrik Lundqvist, Jesper Fast, John Moore, JT Miller, Kevin Hayes, Kevin Klein, King Henrik, Lee Stempniak, Madison Square Garden, Marc Staal, Martin St. Louis, Mats Zuccarello, Matt Hunwick, MSG, MSL, New York Rangers, NHL, NHL 2014-2015 Season, NHL All Star Game, NY Rangers, NYR, Ottawa Senators, Penguins, Pittsburgh Penguins, Rangers, Rangers Nation, Rangerstown, Rick Nash, Ryan McDonagh, Tanner Glass, The Ranger Zone. Bookmark the permalink. Leave a comment.